President Harry Truman was a disappointment to the Democrats, and a godsend to the Republicans. Every attempt to paint Truman with the grace, charm, and grandeur of Franklin Delano Roosevelt had been a dismal failure: Truman's virtues were simpler, plainer, more direct. The challenges he faced-stirrings of civil rights and southern resentment at home, and communist aggression and brinkmanship abroad-could not have been more critical. By the summer of 1948 the prospects of a second term for Truman looked bleak. Newspapers and popular opinion nationwide had all but anointed as president Thomas Dewey, the Republican New York Governor. Truman could not even be certain of his own party's nomination: the Democrats, still in mourning for FDR, were deeply riven, with Henry Wallace and Strom Thurmond leading breakaway Progressive and Dixiecrat factions. Finally, with ingenuity born of desperation, Truman's aides hit upon a plan: get the president in front of as many regular voters as possible, preferably in intimate settings, all across the country. To the surprise of everyone but Harry Truman, it worked. 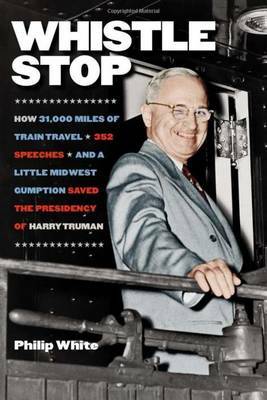 Whistle Stop is the first book of its kind: a micro-history of the summer and fall of 1948 when Truman took to the rails, crisscrossing the country from June right up to Election Day in November. The tour and the campaign culminated with the iconic image of a grinning, victorious Truman holding aloft the famous Chicago Tribune headline: "Dewey Defeats Truman."